Kristel and Peter had a small, casual New Hampshire wedding on toasty summer afternoon (it was only 90, but felt more like 110!). Their ceremony was in a classic tiny New England church (my cousin was married there in December and actually, my aunt Lynda and uncle Tom were guests at this wedding! Fun!) and the reception was at one of the more unique venues I have photographed- a small, moody music hall (artists like The Samples and Lisa Loeb are scheduled to perform there later this summer). Details of the day (I really like this collage format and will likely start using this for all my weddings. Do you like it?). The sweet couple (Kristel and Peter are very shy. I know it was hard for them to be the center of attention all day long and I did my best to capture the tenderness between the two of them when mugging for the camera, or when they were able to forget they were being photographed). The flower girl, Kristel's niece Reyna, was not happy about having her picture taken with her brother Conor (the ring bearer) and made sure to keep her eye on me during the ceremony. The newlyweds will be heading to Kristel's hometown in Oregon to have a second reception in September (notice the Bridal Veil, OR, postal address on their wedding invitations in the collage- nice touch! ), so the celebration continues for these two! Enjoy! Many thanks for having me!! 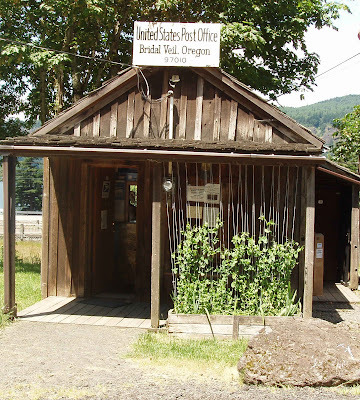 Update: Kristel emailed me a picture of the post office in Bridal Veil, OR, where her parents had her wedding invitations hand canceled. Wow! nice collage set up, pictures look great cant wait to see the rest when P & K get them. Keep up the great work. You know I love the collage setup, but that first (?) dance shot is truly something special. Incredibly intimate. I just can't stop staring! Emilie... you are amazing! Thank you so much. I love the collage and the picture of the two of us and my niece just being herself! We went through all almost-1000 pictures last night. They are wonderful. I re-lived the whole day. I can't wait to make an album, but how will I ever be able to choose 60-80 of my favorites?